I’ve lived in Salt Lake City on and off since 1997. During the “off” times, I’ve lived and worked in Antarctica. You can say by living in Antarctica, I became an adventurer, but if you said that, I’d call you a liar. Really, I just needed a job. Some people wait tables; others mow lawns. I went to the South Pole. Antarctica has been said to have, per capita, the most educated people on the planet. A lot of the people I worked with were scientists, doctors and grad students studying everything from fish that can live in frozen water and global warming to ways to inhabit the moon. These scientists may have come from diverse backgrounds, but they had one thing in common: They all had to eat. And I was their dishwasher. During one 14-month stint, it was often said that, as the dishwasher, per capita, I was the stupidest guy on the entire continent. Luckily, when the scientists said this to me, they spoke in Latin words like schmuck, fuctard or dumbarse, so I didn’t understand their scientific hypothesizing. The only place to eat in the science base where I lived, McMurdo Station, is the galley. This meant there is only one place where dishes pile up and, therefore, only one place where I worked 10 hours a day, six days a week. While my co-workers came into the galley from outside, telling adventure stories involving penguins, I could only contribute by telling dishwashing adventure stories. The scientists would say, “Good one, fuctard” and then break off one of their frostbitten fingers at the joint and use this digit to add flavor to their bland food. Working in the galley, I was witness to everyone’s eating habits. One guy ate eight eggs every morning and quite a few didn’t dirty much silverware because they thought the thumb was a utensil. Then there was Tad. side of frozen vegetables. It’s all you can eat, and desserts come with every meal. For Tad, desserts were the meal. On cookie Wednesdays or cinnamon-roll Thursdays, Tad was always the first one to queue up in line for a dinner of desserts. He could make a meal of cookies, pies or cobbler. After eating dinner, he’d have ice cream for dessert. If you are what you eat, Tad is a treat. While I’ve decided to permanently de-thaw from Antarctica, Tad still works on “The Ice.” To keep Tad and other Antarcticans from going The Shining crazy, the National Science Foundation requires regular vacations. The theory is “All Antarctica and no U.S.A. makes Tad a dull boy.” This week, Tad’s sanity vacation brought him to Utah. 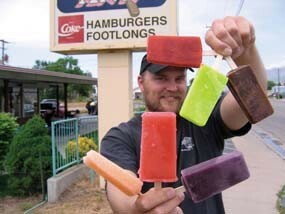 Even though my neighborhood has some great places to take a frozen person to for frozen delights, I knew what Tad would most appreciate was a Pace’s Dairy Ann (1180 S. 500 West, Bountiful) Astro bar. Once, back in Antarctica, Tad and I were caught outside in a storm, and we had to step into the food freezer to warm up. 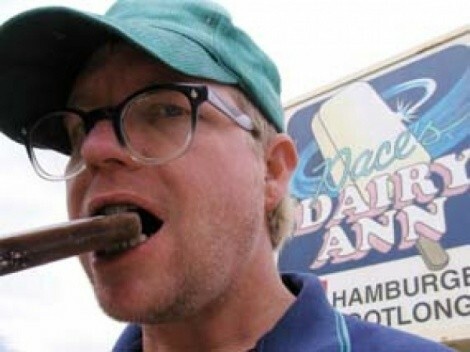 Since being a human Popsicle was not a sweet experience, I reasoned I should take Tad to Pace’s Dairy Ann for a sweet peach, cherry, grape or lime Astro bar.